32 inch (81 cm) 16 : 9 Stereo A2 + Nicam colour Television/Monitor, On Screen Display, Hyperband, Teletext, full function remote control. 33 inch (83 cm) colour Television/Monitor, A2 Stereo Sound, On Screen Display, Hyperband, Fast Teletext and full function remote control, Double SCART A/V connector. 33 inch (83 cm) colour Television/Monitor, A2 Stereo Sound, On Screen Display, Hyperband, 4 pages Fastext, full function remote control and Double SCART A/V connector. 29 inch (73 cm) colour Television/Monitor, A2 Stereo Sound, On Screen Display, Hyperband, Fastext, full function remote control and double SCART A/V connector. 28 inch (70 cm) colour Television/Monitor, Stereo A2 + NICAM, On Screen Display, Hyperband, Teletext and full function remote control. 100 Hz double scan frequency. 28 inch (70 cm) colour Television/Monitor, A2 Stereo Sound, On Screen Display, Hyperband, 4 pages Fastext, full function remote control and SCART connector. 28 inch (70 cm) colour Television/Monitor, A2 Stereo Sound, On Screen Display, Hyperband, Teletext, full function remote control and SCART A/V connector. 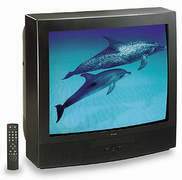 25 inch (63 cm) colour Television/Monitor, A2 Stereo Sound, On Screen Display, Hyperband, Teletext, full function remote control and SCART A/V connector. 21 inch (53 cm) colour Television/Monitor, A2 Stereo Sound, On Screen Display, Hyperband, Teletext, full function remote control and SCART A/V connector. Stereo look 21 inch (53 cm) colour Television/Monitor, 90 preset channels, On Screen Display, Hyperband, Teletext and full function remote control. 21 inch (53 cm) colour Television/Monitor, On Screen Display, Hyperband and full function remote control.